Born and raised in South Korea, Chef Soogil Lim was originally majoring in Biology. His interest in culinary world was sparked when he went into a restaurant and saw a sign that said “Make People Happy.” It prompted him to research culinary education and enter the Culinary Institute of America in Hyde Park, NY. Upon graduation, he began his training in French cuisine at Daniel, one of New York’s most acclaimed fine dining restaurants. Through his hard work and great talent, he was able to move up the ranks and become the first Korean Sous Chef in the restaurant’s history. 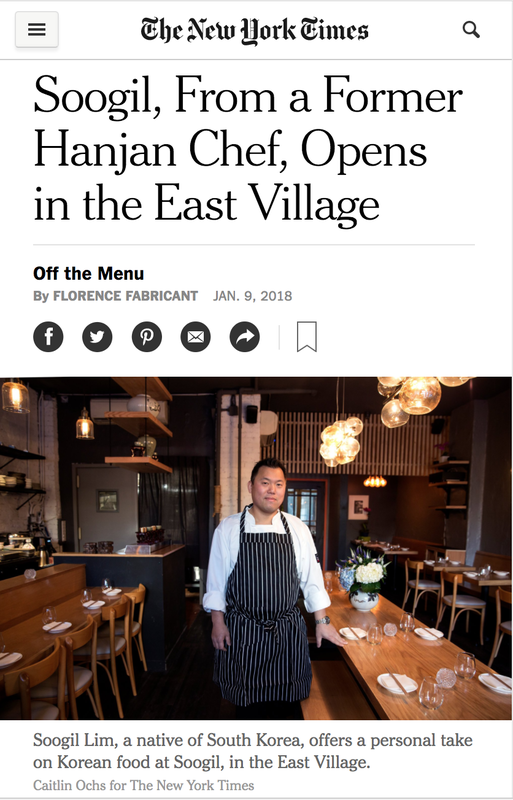 After working for 7 years under Chef Daniel Boulud (three as Sous Chef) and honing his French technique, he became Executive Chef at Hanjan, where he ran the kitchen for 4 years. With the opening of his own restaurant, Chef Soogil Lim will blend the two backgrounds he knows best: French and Korean. "The care the kitchen pays to technique is obvious in the seafood dishes; I’ve never had one that wasn’t perfectly cooked. Monkfish, which can come off as a rubber replica of some part of the anatomy I’d rather not think about, gets wrapped in a cabbage or lettuce leaf, gently poached, and sliced into neat little wheels. Arranged over stir-fried vegetables in a sea of fermented chile sauce, it’s terrific, and about as French as Korean cooking should be allowed to get." Hence, our good fortune in the timing of our visit to Soogil, a largely Korean restaurant that opened in January 2018 in New York’s East Village. Chef Soogil Lim produced dishes of exceptional quality, at the exceptionally good price of $65 for an 11-course tasting menu, justifying everything we had heard about him and his simply decorated restaurant. The quality of the wines on offer was similarly impressive. These included by-the-glass offerings of Raventós y Blanc’s 2016 sparkling wine from Penedès; the Village bottling of Kumeu River 2016 New Zealand Chardonnay; a half-bottle of excellent Rioja, Viña Ardanza Reserva 2008; and glasses of Ostertag Riesling 2015 Alsace and a Barbaresco 2015 from Adriano. After seven years in the kitchen of Daniel Boulud’s flagship institution, Daniel, it’s no surprise that chef Soogil Lim named his first solo project after himself. Tucked away in the East Village, this petite gem is packed with downtown dwellers sipping soju cocktails at a long, wooden communal table while awaiting the culinary creations of NYC’s latest in a trending class of contemporary Korean restaurants. Lim’s refined French technique infuses with his Korean heritage for exceptional dishes that stay true to both. Delicate glass noodles laced with tender shredded vegetables are artfully twirled under a heap of beef bulgogi (you should probably order two of these). Expertly seared foie gras crowns a bed of crispy rice before getting hit with a tableside pour of soy sauce that sizzles and steams as it drips onto the red-hot cast-iron plate. The dining spectacles trickle into dessert, with a tower made of addictively chewy fried-dough sticks arranged à la Lincoln Logs and topped cautiously with a scoop of honey-chestnut ice cream. The best thing on the menu? The price tag: Almost nothing exceeds $20. Early in his career, Soogil Lim, a native of South Korea, switched from academia — biology — to food, and eventually graduated from the Culinary Institute of America in Hyde Park, N.Y. He became a sous-chef at Daniel, then moved on to be executive chef at Hanjan in the Flatiron district. Now he’s on his own, with a personal take on Korean food. Brussels sprouts are tossed with pan-fried tofu, peanuts and crispy seaweed; a mung bean pancake is made with sprouts, kimchi and lard; root vegetables and soy sauce accompany braised short ribs; flaked cod comes with soy-braised radish; and spicy soft tofu with assorted seafood swim in a spicy seafood broth. His intimate restaurant, seating fewer than 40, is a study in neutral tones, enlivened with art and Korean pottery: 108 East Fourth Street (First Avenue), 212-529-3704, soogil.com. Celebrated chef Soogil Lim (Hanjan, Daniel) will open a Korean-inspired small plates restaurant in the East Village. The menu will combine flavors from Lim’s native Korea with techniques from his French culinary background. The drink menu will use Korean spirits like soju and makkoli to update classic French cocktails. Projected opening: January, 2018; instagram.com. 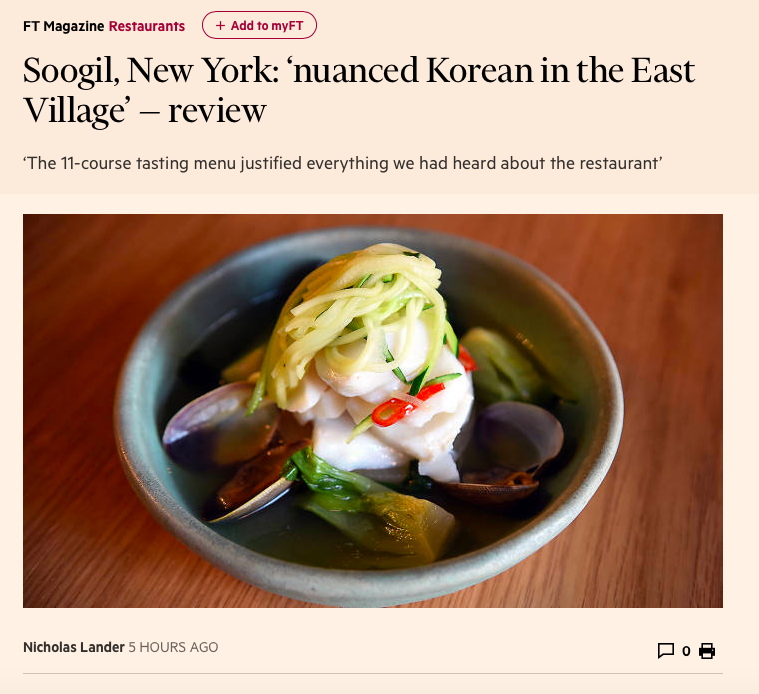 New York City’s modern Korean dining scene gets a boost today with the opening of Soogil, an East Village restaurant from Soogil Lim at 108 East 4th St., between First and Second avenues. Lim is a South Korea native with time as Daniel’s sous chef and Hanjan’s executive chef. With this opening, NYC has no shortage of casual but refined Korean restaurants; Oiji and Atoboy both tidily fit into that genre, too. Soogil, with its toned-down wood and grey aesthetic, joins the mix for dinner, Monday through Thursday from 6 p.m. to 11 p.m., Friday and Saturday from 6 p.m. to 12 a.m., and Sunday from 5 p.m. to 10 p.m.
Three words: Spicy soft tofu. Chant them under your breath. Whisper them to your loved ones. Just think of them for a few seconds, if your memory works well like that. Because come time for you to try Soogil, they're the three words you must say to your waiter. 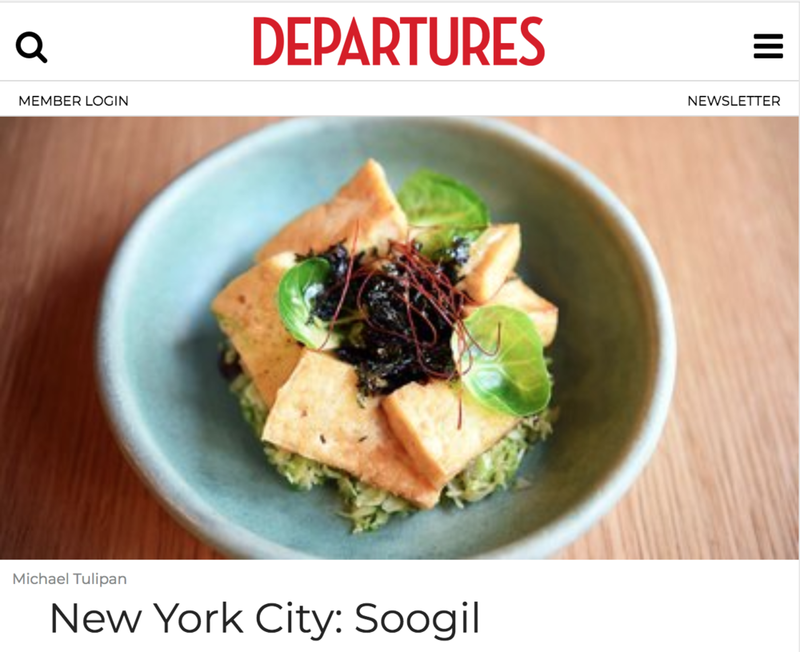 Right, Soogil: that's the new modern Korean spot we're going to talk about today, and it's opening tonight in the East Village. It's a bright, sleek-looking spot: with floor-to-ceiling windows overlooking East 4th, wooden tables, and a desirable nook straight back that'll sit you and 6 of your closest Korean food-loving comrades. Come with them. Claim said nook. Start with some sake or makgeolli (their liquor license should be in within the week) before inspecting the menu crafted by Soogil Lim—a chef who, here, is combining the influence of seven years at Daniel and four years at Korean spot Hanjan. What that means for you: pork belly with a kimchi roll and salty shrimp sauce, braised short rib with winter vegetables and that afore-hyped soft tofu dish, which consists of tofu flan topped with shrimp, squid, manila clams, served with a gravy boat full of hot, spicy seafood broth. Just about everything we mentioned is right here in photo-form, if you care to check that out. Happy Tuesday. For 6-12 guests, we reserve communal table or private inside seat with a Chef's choice prix-fixe menu at a different pricing. Due to the intimate size of our dining room, we are able to accommodate only a selected amount groups of this size each evening as business demand allows.